Passion Fruit and Honey - A Tropical Delight! 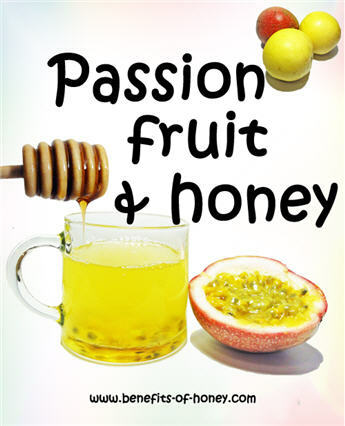 Passion Fruit and Honey - A Tantalising Remedy! Passion fruit, a tropical oblong-shaped fruit that I began to be curious about only two years ago, has lately become a big hit for me. Citrus fruits such as lime, lemon, grapefruit, and pineapple tend to go very well with honey, but I have to say this particular fruit makes a remarkable, exceptionally delicious, rejuvenating drink when mixed with honey water. Personally, I love to use orange blossom honey as a sweetener for my chilled passion fruit drink. An exceptionally brilliant, refreshing fruity concoction for a hot sunny afternoon! Interestingly, this fruit seems to have many different species as its shell can come in different colors and tones -purple, red and even yellow. When they are very ripe, the skin turns wrinkly (Note: But the flesh inside is perfectly fine, so don't throw them away.) Cut the fruit into half and scoop out the orange-yellow, jelly-pulp flesh and black seeds that look like tadpole eggs. The flesh can be consumed directly together with the seeds like a snack. However, many people I know are grossed out and turned off by the appearance and would not give it a try. Some species are extremely sour, while others are sweet. 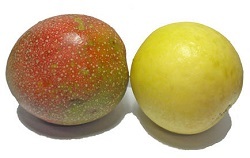 Nevertheless, its highly aromatic pulpy flesh is popularly used as an flavoring for making juices, cocktails, ice-creams, sorbets, jams, pies, desserts, and sauces. - Is packed with carotenoids and polyphenols that provide a great source of antioxidants that helps eliminate free radicals and toxins in the body. - Reduces symptoms of asthma, allergies, respiratory track inflammations, and treats cough. - Has a calming effect, relieves anxiety, muscle tension, and keeps insomnia away. - Supports healthy regulation of blood pressure and reduces risk of hypertension and stroke. - A high fiber drink that cleanses the colon and improves digestion. The fiber also cuts down on fat and cholesterol buildup in the body, protects intestinal health and helps prevent constipation. Get some to try if you haven't, it's a fruit worth tasting and discovering its benefits. I would usually get a few bags of it whenever I see them in the shops as they are not so commonly available in where I am residing. End of "Passion Fruit and Honey - A Tropical Delight!". Back to "Honey as Home Remedy"